Cool Theme.Just what i need. How i do to put submenu in the Top menu of the template? I’m sorry but… If you wish to add a submenu, you’ll need a full tutorial about how add a jquery dropdown menu (search in Google ;)). the menu on top don’t appear, I put the links but don’t work, what’s the problem? 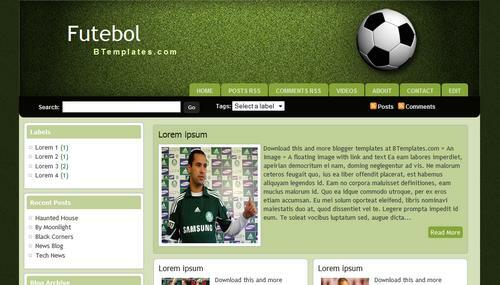 nice template for blogger. Thank you very much for good share. How do I change the light green background color that appears between the blog posts and sidebar? I can’t find it in the HTML. Thanks! Fantastic template! How do I take away the label gadget at the top? It’s getting in the way of things. By the way it’s a beautiful template. Thankyou so much for sharing it with everybody. This will completely delete the header. Nevertheless, you can replace that image by another one with the same proportions. How can I change the color beige of the template? Claudia, ¿Cómo podría cambiar el tamaño de las fotos en el menú principal? Es que cada vez que subo un post la imagen se me estrecha y se estira de arriba a abajo y queda mal. Encuentra estos códigos en la plantilla, que corresponden al tamaño de las miniaturas de imagen de los posts en general, y de la imagen del primer post, respectivamente. Los números a cambiar son los que acompañan a las variables “img_thumb_height” y “img_thumb_width”. Another Situation is my blog is in portuguese and does not make any sense having the buttons read more in english how do i change it to Ler Mais? Claudia, ¿Por qué no aparece el menú? Tem que ajustar o cabeçalho. Também procurei bastante e aprendi. esse é o tamanho que deixei. já resolvi as situações que tinha pendentes, mas ao tentar adicionar uma nova pagina ela depois aparece-me como um post na primeira pagina e não deixa ver tudo! que faço? Tienes que configurar los links desde un gadget que hay cerca de la cabecera en Diseño/Elementos de la página. YA lo encontré, Gracias! Siento ser molesto, pero como podría poner los links a la izquierda del banner y cambiarle el color¿? First, I love this template. It’s exactly what I was looking for. With that stated, whenever I post a blog, there is a section for ‘Related Articles’ but it’s in Portuguese! It says, in bold letters, ‘Artigos Relacionados’ I have combed through the html editor and can’t find this anywhere. How can I change it to English? Hola Claudia. ¿Habría algún modo de indicar el número de comentarios en las entradas? Settings > Publishing > Show 15 posts on the main page. But but it seems only 5 posts. What can I do? hola claudia, sabes como quitar el elemento “Tags” de la parte de arriba? el que esta junto a la barra de busqueda. Sí, pero necesitarías hacer cambios en tu plantilla. Busca en Google “numerar+comentarios+blogger”. I load but menu html is not in its html. There is no HTML for the menu bar. You need to configure that link list gatget that is under the header in Layout/Page elements. I ‘ve read your response to iyaanja about the menu on the top (about,contact,etc). ola claudia não dei esse blog com duas colunas de Gadget? In the section for ‘Related Articles’ is in Portuguese (‘Artigos Relacionados’). I have searched through the code but cannot find out how to change it to English. Could you please help? It was more towards the bottom, near the footer code. Thanks again for a great template! Nope, that wasn’t the code! I can’t seem to post it here. If you search for ‘backlinkLabel’ it is about 6 lines down from there. ola claudia não tem como colocar duas colunas de Gadget (uma de um lado outra do outro) nesse template? @miranda: Please, read this article in our blog: Adding a sidebar to a Blogger template. I love the layout of your blog, but have a few more changes I can’t figure out. How do I remove the labels and search from the top of the page (under the header)? How do I change the background of the sidebar from a color to a url? You sould learn more if you search in Google “CSS+background+property”. Claudia does not have much knowledge of HTML and CSS do not have the way you do this favor for me? Thank you! One more question… I now have a line running through the first post. Not sure what I did or where to look. Any suggestions?